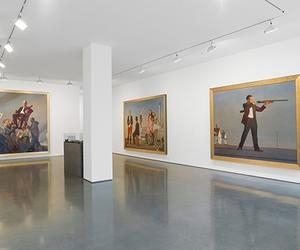 On the same block where Bo Bartlett’s first solo exhibition in New York opened 35 years ago, Ameringer | McEnery | Yohe is giving audiences a sneak peek into the much anticipated Bo Bartlett Center, set to open in Columbus, Georgia next fall. Journals, preparatory drawings, and palettes piled high with miniature cliffs of oil paint are just a glimpse of what Bartlett has donated to his center. The mid-career retrospective also features his latest work, along with his cache of props and ephemera, many of which are dutifully rendered in the works themselves. These freshly executed pieces hold fast to Bartlett’s endearing style of Realism with a curious twist. He proudly carries on the American lineage of Winslow Homer, Thomas Eakins, and Norman Rockwell, but there is an oddity about his works that creates psychological pause within the viewer, and sets him apart from the Realist tradition. In response, the term Magic Realism is being revived. Halloween” (2016), on view here, exemplifies the subtle tensions that Bartlett’s fans have come to love and expect from his work. The carefully placed figures subtly juxtapose reality and fantasy within this large-scale canvas. The arresting glances of his characters transform his paintings into mesmerizing film stills that linger within our minds. Bartlett, also an award-winning documentary filmmaker, likes to use props and costumes, occasionally having pieces especially made for the sitter. At the age of 18 the artist moved to Florence, Italy to study mural painting under American expatriate Ben Long and this experience still informs Bartlett’s tendency to plan his compositions before he begins painting. Drawing from Halloweens that Bartlett remembers as a child, this scene is grounded in a particular memory, but still manages to seem slightly unhinged from reality. The only visible evidence of candy is one crumpled wrapper left on the road — a prop that we can actually see in the vitrine that also displays the old photo that inspired this work. Upon initial observation there is nothing out of the ordinary, but we slowly begin to stare in wonder at the small parade of children. With closed mouths they march across the street in frieze-like formation, and this discreet omission of sound and laughter creates a tangible sense of mystery. The silence emphasizes the vacant surroundings while the children’s bright, lively garb seems at odds with the dull, barren land. Our vacillation between the plausible and the peculiar is fundamental to Magic Realism’s slight subversion of the ordinary, and its main difference from Surrealism. During the 1930s, Social Realism allowed American painters to express their political discontent with unfavorable domestic and social conditions. As Surrealism was gradually introduced to these artists, aspects of horror and fantasy were integrated into Social Realism creating a hybrid style called Social Surrealism. In the following years there was a large of amount of artwork that hovered between the real and the imaginary leaving critics at a loss for accurate descriptions. It wasn’t until 1943 that the Museum of Modern Art curators Alfred H. Barr and Dorothy Miller provided clear definitions for Magic Realism in conjunction with the show Americans 1943: Realists and Magic Realists. Both historians agree on two key elements: Magic Realist paintings lack visible brushstrokes and their scenes are improbable rather than impossible. When combined, these two elements create an eeriness that may be unlikely, but not entirely unbelievable. “Galilee” (2014), for example, is so crisply painted it appears reasonable that a quartet might perform standing in a small boat on the open water, but in reality the breaking waves would leave the musicians too unsteady to perform with such ease. The performers’ direct eye contact with the viewer makes us wonder if they’re playing for us, and if so, that also places us in the sea. Similarly, the likelihood of coming across the seemingly stranded family of circus performers seen in “Samaritans” (2014) is slim, but there is a veracity to the work that transports us to the roadside, and suddenly it’s not so unlikely. While the distilled Americana of “Halloween” could be set almost anywhere, somehow it rings true of Columbus, Georgia and the essence of spending one’s childhood there. It evokes the open air of Lakebottom & Weracoba Park, where Bartlett grew up and where I went to high school. The palpable warmth in his paintings’ atmosphere conjures the dusty white sand that lingers in the air at the end of the day. Just minutes from this historic park, the Bartlett Center will allow visitors to see over 18,000 square feet of curious objects, which could include a whale’s jaw bone or vintage nursing cap, lying adjacent to their depiction in the artist’s monumental paintings. Seeing the studied objects helps us understand why we do not initially approach the canvases as fictional. We encounter the work as though the scenarios were real, and therein lies the intrigue of Bartlett’s work, which is his is ability to paint what exists before him with a sleight of hand that never strays too far into fantasy. Bo Bartlett continues at Ameringer | McEnery | Yohe (525 West 22nd Street, Chelsea Manhattan) through August 12.